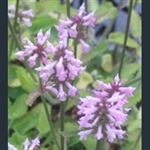 The various kinds of betony all have angular upright stems and soft, hairy leaves, usually aromatic. The labiate flowers are clustered along the upper parts of the stems, often small in themselves, but together making attractive splashes of colour, which is usually in the pink-purple range. Densely hairy all over; silvery grey foliage and spikes of pink flowers.